Are you planning a meeting for your business or other organization? Our Lake of the Ozarks resort has the ideal space available for you. 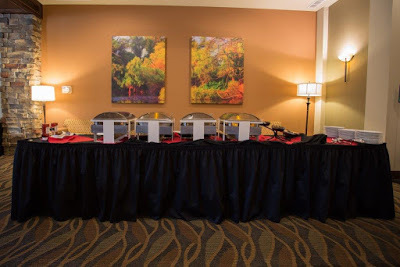 From flexible meeting space at the Lake of the Ozarks to tasty catering menu options, you are sure to wow your guests. Impress your colleagues and others you do business with when we help you pull off a flawless event. To learn a little more about the amenities we have available, take a look below! We can accommodate meeting space for almost any size group! Whether you're looking for a small business meeting or a large gathering for a conference, we've got you covered. Our flexible meeting space allows for easy transitions between events, during your meeting. We also have great spaces for pre-meeting networking and other breaks throughout your stay. In addition to the ideal space, we have audio and visual capabilities, as well as wi-fi for your devices. With a wide range of menu options available, we can cater to many taste preferences. From breakfast, lunch, dinner, snacks - and everything in between - we've got your catering covered! Our catering menu options can be customized to fit the wants and needs of your group. We also have beverage catering choices available. Once your meeting has ended for the day, it's important to have a great place to entertain your guests. Our resort offers a wide range of amenities. 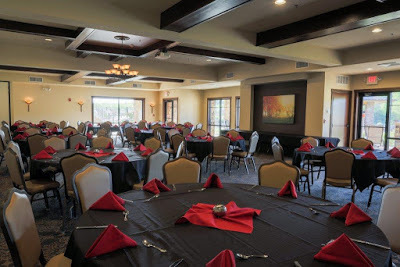 Our fine dining establishment - The Trophy Room - is a great place to eat a delicious meal and relax with a cocktail at the end of the evening. 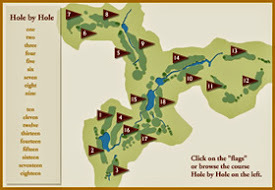 Our award-winning golf course is a great way to continue your networking from the meeting. Other amenities include The Sand & The Ice - sand volleyball and ice skating rink during the summer and winter, respectively. We have a number of great lounging areas to get to know other meeting attendees and enjoy a tasty drink. An indoor and outdoor saltwater pool is also available for our guests' enjoyment. To top it all off, we have an on-site spa offering the perfect place to relax. 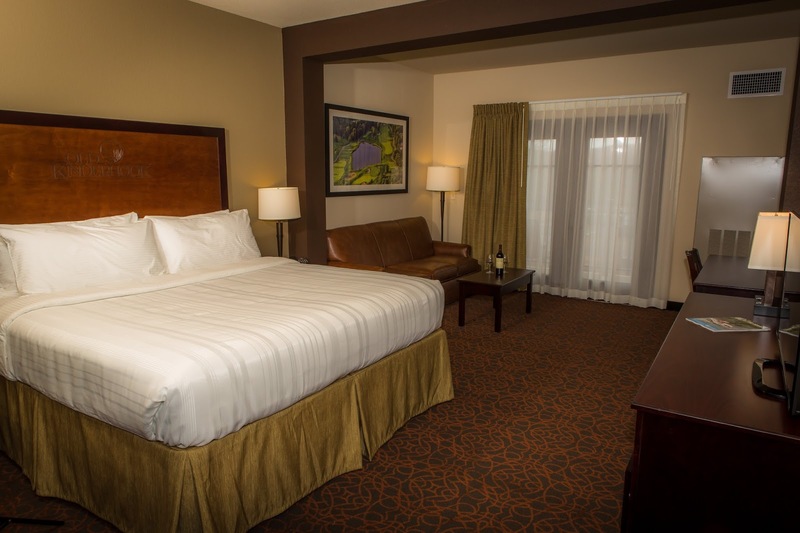 If you have guests visiting from out of town, take advantage of our fabulous lodging options. The Lodge - our newly constructed hotel - offers many rooms for our guests. From double queen to single king, you can find the type of room that meets the needs of your meeting attendees. Relax after your meeting and don't rush home. Enjoy all the beautiful resort has to offer by taking advantage of our rooms with a breathtaking view over our golf course. In addition to The Lodge, we have golf cottages, villas, patio homes, and estate homes available for your stay. 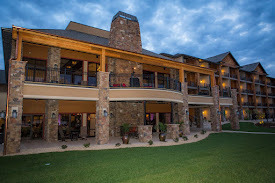 We have a wide variety of lodging options for you! Located in the heart of Missouri, the Lake of the Ozarks is a great crossroads for many. With major highways from St. Louis, Kansas City, Columbia, and Springfield areas, it's an easy drive for many of your meeting guests. What are you waiting for? Give us a call at 573-317-4314 to book your meeting space today. Here at Old Kinderhook, we look forward to helping you create the ideal place for your next business meeting. 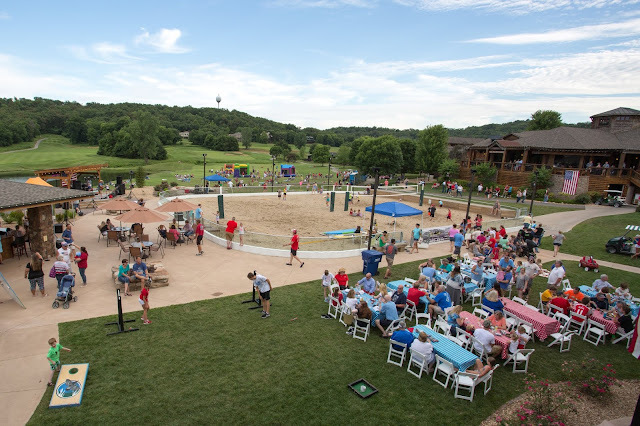 Whether you are planning a small business meeting or a large social gathering, our golf resort at the Lake of the Ozarks is the perfect place for you! We would be honored to help carry out your vision for your upcoming meeting!